Short forms of commons words, positions, and place-names are used throughout the text where these are free of ambiguity and permit additional information within the space available. 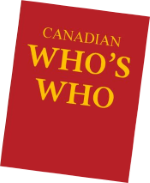 However, many other abbreviations, particularly ones relating to academic degrees, honours, and awards, also necessarily appear in the course of the biographies, and the following list of meanings is offered for the convenience of users of the Canadian Who's Who. Owner/President Management Program - Harvard Business Sch.